Did you know that the Australian dingo is facing extinction? Sad but true, it doesn't look real good for the dingo. The Australian dingo is in dire need of an image overhaul and help, so our grand children can still see dingoes in the wild and not only in picture books. (If you read other articles about Australian animals on this site you will find more whose image does not do them justice. Let me introduce you to the Australian dingo, a friendly, intelligent and inquisitive canine, and an integral and necessary part of our environment, the Australian Outback. I'll start with general information about the Australian dingo, like its history and dingo facts. Then I will look closer at the dingo's reputation, and at the chances for the survival of the species. Another question the scientists argued over is whether the Australian dingo descended from domestic or from wild dogs. The one fact that they agreed on is that the Australian dingo did not arrive with Australia's Aboriginal inhabitants, who have lived here for over 40,000 years. Today we know, thanks to modern genetics and DNA technologies, that Australian dingoes descended from a few domestic dogs (it could have been one single pregnant female...) that reached Australia from South-East Asia. They only turned feral later. But they were also adopted by Aboriginal people as a companion animal. When the European settlers arrived they saw that the "Warrigal", as the Aboriginals called them, was without doubt of canine origin. They also saw that these "wild" dogs weren't all that wild, rather they were highly valued by the Aboriginals as camp cleaners, guard dogs or hunting companions etc. Europeans started crossing their own dogs with the Australian dingo. The unique Australian working dog strains like the Queensland blue heeler or the Australian kelpie are recognised dingo hybrids. An elegant medium sized dog, the fully grown Australian dingo is up to 60 cm tall and weighs between 13 and 19 kg. The colour of a dingo reflects its surroundings. Most common is a reddish, golden yellow or sandy coloured coat (desert dingoes). About 10% of the population show a dark or even black coat with tan markings (in forest habitats), and a very small number, less than 1% can be very light cream, nearly white (alpine dingo). Dingoes don't bark, they only howl. The Australian dingo breeds once a year (twice is normal for dogs), usually starting at the age of one or two. The breeding season is from March - June and the average size of a litter is four to five. Both parents take part in the raising of the pups. The den can be a hollow log, a rock shelter, an old rabbit warren or similar. Young dingoes will start leaving the den for short periods of time at about 3 weeks of age, they will be fully grown at 7 months. The normal life span of a dingo is up to 10 years in the wild, but can reach 13 to 18 years in captivity. Dingoes have a clearly defined territory which they rarely leave. Often they live alone. They also form packs consisting of the parents and their offspring of several years. Dingoes also hunt for food alone (mainly at night), although they can hunt bigger prey in packs. The dingo is a carnivore, but like other wild dogs it can live without meat. Actually, like all dogs dingoes should be called omnivores. They can eat meat but don't need to. So how did the Australian dingo get such a bad name? The dingo became an outlaw as soon as the first sheep arrived in Australia. The wild dogs quickly learned that sheep are easy pickings. The dingo population multiplied as a result of the sudden bounty and their huge numbers caused serious problems for the farmers. Dingos were classified as vermin and that is how they are still seen by many today. A pest that should be hunted and killed. What came next was even worse. In 1980 Azaria Chamberlain disappeared from a tent near Ayers Rock, her mother claiming that a dingo had taken the baby. Lindy Chamberlain went to prison for murder, but she was later released and exonerated after new evidence suggested that she had been telling the truth. Some Australian states forbid that dingoes be kept as pets, some allow them. Everybody who knows dingoes as pets will tell you that they are not much different from domestic dogs. Their particular characteristics are outstanding intelligence, curiosity and playfulness. They are great with children, and are also somewhat timid and aloof. So why are Australian dingoes still being baited, trapped and shot? Ever since Europeans started settling in this country their dogs have been inter-breeding with wild dingoes. The dingo is often the scapegoat when farmers lose sheep or calves, when in reality hybrids or even dogs with collars are the real culprits. Dog trainers will also tell you that hybrids are a nightmare to train, they are "like badly wired electrical systems". Pure dingoes however surpassed all expectations when trained as Seeing Eye dogs (there is only one) or sniffer dogs (three). I used to live in a different part of the valley, a farming area. Dingoes weren't a problem when I first moved there, until one farmer's pit-bull terrier fathered a hybrid litter. Several years later a pack of "dingoes" was causing havoc in the area. In one season not one calf survived and even domestic dogs that were protecting their territory or their herd were mauled... 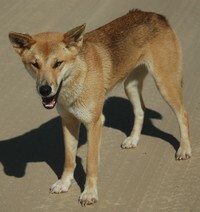 Although people are aware of the hybridization issues the dingoes are blamed. It's crazy. Dingo eradication campaigns and baiting programs also have unwanted consequences. Removing the dingo means upsetting the ecological balance. You cannot take out the top predator and expect things to be just fine. Does the Australian dingo have a future? Nobody knows where the dingo is standing because there simply is no money available for the necessary research. The rest of the world seems to be a lot more concerned about the Australian dingo than our own government. It puts millions into destroying and nothing into preserving Australia's native dog. It might be true for now, but we don't know for sure. Dingoes are prolific across vast stretches of the Northern Territory and Western Australia, all the remote areas of the Australian Outback that this website is about. But there is no genetic data, and there is no funding for sampling. The little sampling that has been done showed alarming results. Pure dingo numbers have collapsed through most of south-eastern Australia. If nothing is done it is only a matter of time until pure dingoes completely disappear from the Australian Outback. I'd like to be more cheerful about this, but despite the dedicated efforts of several individuals and conservation groups it doesn't look good. If you would like to receive newsletters and get in touch with the incorporated group Save Fraser Island Dingoes, email the Secretary Save Fraser Island Dingoes. The Australian Geographic published an article about the dingo hybridization issue in March 2011. As you can see, they back up everything I say on my page, which was written in 2005. The only thing that has changed since then is that there are even fewer dingoes left. A note to all the angry people writing to me about the cattle or sheep they are losing, and abusing me and telling me what an idiot I am: guys, you totally missed the point. The point is that the dogs attacking your stock are not dingoes. Nobody is saying that the hybrid wild dogs should be protected.